Winter 2013-14 was one of the coldest on record in North America. Americans used massive amounts of natural gas, drawing down an historic glut in storage. And supplies are still shrinking with US consumption running 19 percent ahead of last year. The price of benchmark NYMEX gas futures soared from less than $3.40 per million British Thermal Units in early November to a high of nearly $6.50 in late February. Spot market gas at the Algonquin Citygate hub serving Boston sold for as much as $22.53 per million BTUs in mid-February, a record high 50 percent above last year’s levels. Action in propane has been just as crazy. The U.S. Energy Information Administration reports wholesale prices surged from less than $1.20 per gallon to a high of $3.60 in late January, before falling back under $1.60 this month. Even long slumping wholesale electricity markets had their day, as we reported in Energy & Income Advisor, several mid-winter price spikes that dwarfed last year’s action. Inclement weather has repeatedly crimped economic activity throughout the winter. Snow and ice storms triggered an unprecedented shutdown of Atlanta, Georgia. But even more winter- hardened areas saw repeated closings of schools, government and businesses, delaying transactions and curbing growth. Seasons change. And more often than not, mild seasons follow particularly harsh ones. The question is what if anything the record cold this winter permanently changed for our investments. Unhedged natural gas production fetched a king’s ransom this winter. Benchmark Henry Hub gas traded as high as $9 per million BTU in February, more than three times its cold weather peak of winter 2012-13. Action at the AECO hub, a key location for Canadian producers, was wackier still, with prices hitting $28.55 per million BTU in early February, 14 times higher than year earlier levels. Those higher prices will show up in calendar first quarter 2014 earnings. But prices for future natural gas production—i.e. available hedges for locking in future production prices—didn’t move nearly as much. Natural gas liquids producers got a kick from higher propane prices. And in fact, rising global export capacity should keep that market robust the rest of 2014, particularly with Russia’s saber rattling in Crimea. The basket of liquids that NGL processors typically extract, however, is still weighed down by weak ethane prices that aren’t improving any time soon. TransAlta Corp’s (TSX: TA, NYSE: TAC) 38 percent dividend cut is a pretty clear indication that conditions are still tough in wholesale power, and coal generation in particular. So are recent decisions by AES Corp (NYSE: AES), Duke Energy (NYSE: DUK) and others to exit wholesale power production in competitive markets entirely. As for overall economic growth, strong non-farm payroll data announced this week is a pretty good sign the weather was primarily responsible for weakness in earlier data. Among other things, that means we can expect the same kind of moderate but steady economic growth in 2014, and that the Federal Reserve will almost certainly be sticking to plan for “tapering” bond purchases. So what did the winter change for investors? Mainly, it once again exposed the folly of relying on a single power source—i.e. natural gas. And it demonstrated once again how providing reliable electricity requires a calm regulatory environment where long-term planning is possible. Southern Company’s (NYSE: SO) decision to build two next generation nuclear power plants in Georgia suddenly looks a lot smarter in the wake of volatile natural gas prices. And carping about the Department of Energy’s now closed loan guarantee has died down. Similarly, surging gas prices dramatically increased the competitiveness of coal-fired power in North America this winter, even as the Environmental Protection Agency is slated to release new carbon dioxide emissions rules for existing coal plants by summer. As a result, many are taking a second look at Southern’s successful demonstration of a 25-megawatt carbon capture system at the Barry plant in Alabama. And the company’s over-budget Kemper plant in Mississippi doesn’t look so harebrained after all. Southern is a buy recommendation for conservative income and long-term wealth building in my Conrad’s Utility Investor advisory. But it’s far from the only potential beneficiary of this winter’s vindication of energy innovation. Last week, I attended the ARPA Energy Summit in Washington, D.C., just across the river from our Capitalist Times’ Alexandria, VA headquarters. The conference featured some 250 exhibitors of potentially groundbreaking solutions to energy industry challenges, an adult science fair for those who like me live and breathe the energy sector. As is the case with all technology expositions, the vast majority of what’s on display will never make it to the commercial stage. Some projects will prove unscalable and therefore permanently uneconomic. Others will fall prey to better mousetraps. Some of the best ideas are likely to fail simply because none of the developers have basic business sense. And still other projects will be abandoned as economics and social needs change. There were more than a few presenters aiming to help the solar power industry solve the issue of intermittent availability, which at this point means all facilities require expensive backup power to smooth out fluctuations to the overall grid. Solar will also benefit from tax credits and generous subsidies at least until 2017, meaning there’s money to go around. I’ve highlighted another of my favorites AES Corp (NYSE: AES) as a leading developer of power storage technology with the financial power, geographic reach and asset diversification to carry it forward. This week, the company announced it’s ready to sell lithium batteries in arrays as large as 500 megawatts to utilities and other operators of wind and solar power plants. LI batteries are used today in laptop computers, smart phones and electric vehicles. Dubbed Advancion, AES’ systems can supply stored power to the grid for up to four hours at an advertised cost of $1,000 a kilowatt. That’s not competitive with baseload power, just as unsubsidized renewable energy is not. But it’s quite an advantage to running peaking natural gas plants, which basically have to be fired up at a moment’s notice, cost an estimated $1,350 per kilowatt even with well behaved gas prices, and carry their own pollution concerns. AES has already proven the technology with its 64 MW battery system serving the Laurel Mountain wind farm in West Virginia, as well as a similar facility in Chile. Initial target markets include California, Hawaii, the UK and the Philippines. And the company intends to certify a range of battery suppliers for its process at its Indianapolis test facility, which should increase its potential client base further. Two other power sector-focused technologies caught my eye at the ARPA-E exposition: One is a carbon capture process designed by researchers at Brigham Young University that basically produces dry ice from coal power plant emissions. The other is modular nuclear power plants under the aegis of the US Department of Energy—spearheaded by an underground project near Lynchburg, Virginia. The Lynchburg project’s end goal is to develop a prototype with generating capacity of 180 MW for startup in 2012. Like Southern’s AP 1000, it’s based on a modular design, meaning all the components are integrated into a single reactor vessel including the cooling system. Had the Fukushima Daiichi reactors in Japan operated with this technology, disaster would have been easily avoided despite the historic earthquake and tidal wave combination. Both of these technologies have a long way to go before they’re commercially viable. Nor is there any guarantee they will ultimately succeed. That’s why the implementers of new power sector technology—utilities in the US—are always the highest percentage way to play this game. While small, innovative companies vie to win the technology battle, these large dividend-paying companies can cash in simply by picking and choosing what works. And thanks to winter’s icy grip this year, there will be a lot of opportunity to do that going forward. 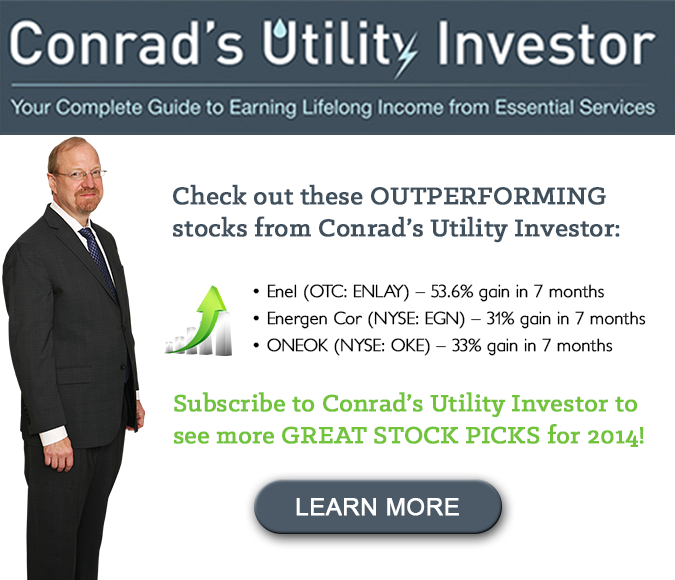 One final note: I’ll be holding an on-line chat for subscribers of Conrad’s Utility Investor on Thursday, March 13. Please tune in and bring all of your questions.